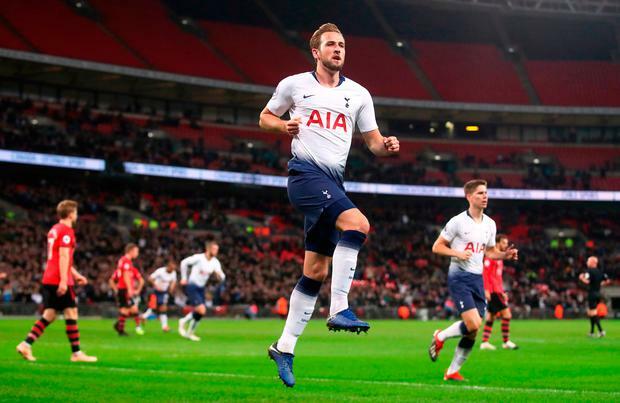 Tottenham Hotspur's Harry Kane celebrates scoring his side's first goal of the game during the Premier League match at Wembley Stadium, London. PRESS ASSOCIATION Photo. Picture date: Wednesday December 5, 2018. See PA story SOCCER Tottenham. Photo credit should read: Adam Davy/PA Wire. The Austrian was named as Mark Hughes' successor earlier in the day and took a watching brief at the national stadium, but for the first hour it was painful viewing. Hasenhuttl will take over from interim Kelvin Davis, who becomes the new manager's number two, and begins the task of guiding the Saints out of the bottom three, though he will have been encouraged by the final 30 minutes as they were the better side and got a late consolation through Charlie Austin. Before that Hugo Lloris produced a number of fine saves and they hit the woodwork three times. The writing was on the wall as early as the third minute when Son was fed by Kieran Trippier's header and his sweet first-time volley crashed into the post. With Hasenhuttl assessing his players, left-back Matt Targett will have earned a black mark next to his name for his lax defending that allowed Spurs to take a ninth-minute lead. As the hosts played a corner short, Targett fatally did not match Kane's run to the near post and the England captain rammed home Christian Eriksen's cross from close range. It was his ninth Premier League goal of the season and seventh in six games against the Saints. With an early goal in the bank, Spurs would have fancied flexing their muscles but they were reliant on a stunning save from Lloris to keep their advantage. The France goalkeeper somehow got his fingertips to a swerving effort from Pierre Hojbjerg and tipped it on to the post. After Eriksen's low free-kick was well saved by McCarthy, Moura fired home from the resulting corner at the second attempt for his fifth goal of the campaign. Hasenhuttl will have at least been encouraged by Southampton's response to going 3-0 down as they showed plenty of spirit.